People eat what’s in front of them; most of the time anyway. If there’s a bag of potato chips on the counter at home we grab a handful, if there’s a box of donuts in the conference room at work we figure we deserve one, and if there is a basket of freshly baked bread provided at the Italian restaurant we empty it. 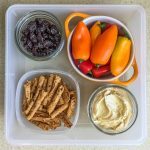 For my last post I talked about a collection of snacks I recently added to my office, with hopes of offering healthy alternatives for hungry students and coworkers. Today I want to continue that theme by telling you about another way I put healthy food in front of people intentionally. I’m lucky enough to be part of a group of colleagues who play a card game called Wizard. It’s one hour a week where we can forget about grading and lesson planning and just have a little fun and friendly competition together. (There are even highly coveted trophies provided for first and second place.) We meet at 2:45, just in time for afternoon hunger to start creeping in. As the food nerd in the group, I started bringing snacks because feeding people makes me happy. 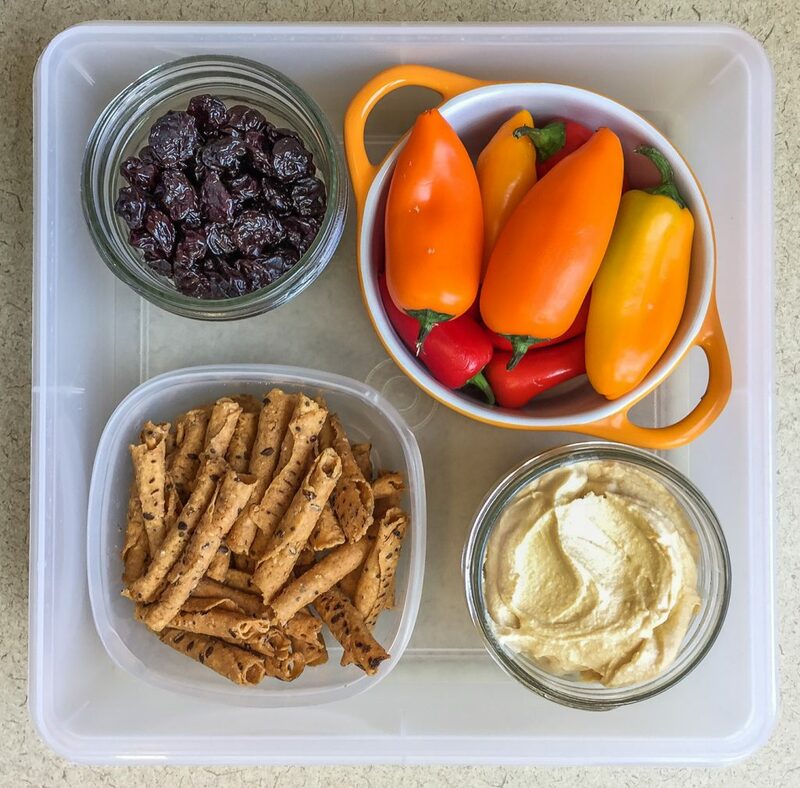 As you can imagine, feeding people healthy food makes me the happiest so I try each week to come up with satisfying finger foods they might like. I know if I brought cookies, those would get eaten. But if I bring cucumbers, those get eaten. I’m telling you, it’s all about availability and convenience. So I thought I’d share with you my last four attempts at portable, tasty, reasonably healthy snack foods. As you take a look at these photos, I hope you see how easy this can be. 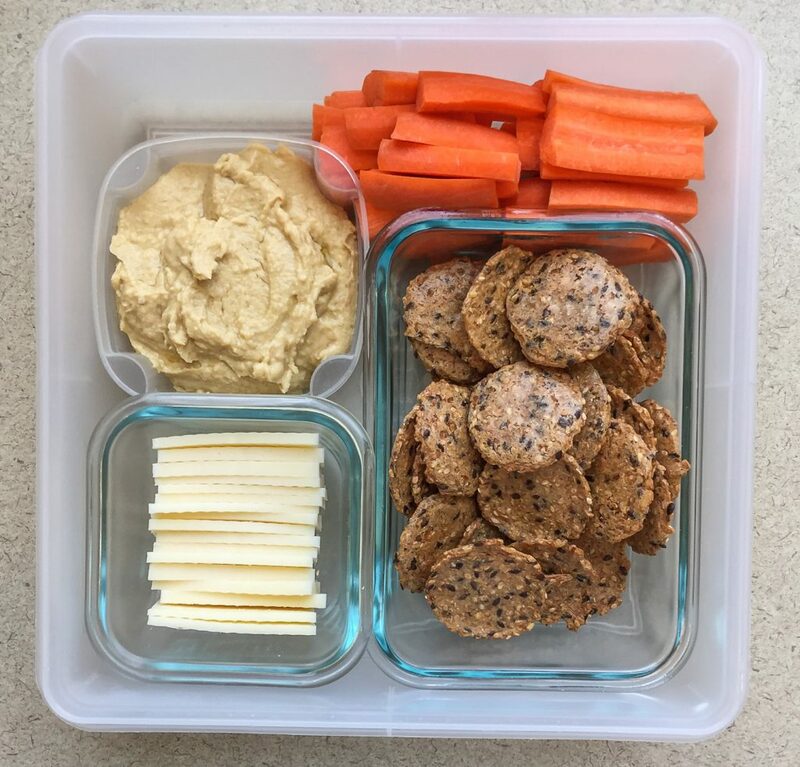 I usually spend less than 10 minutes assembling the snacks the night before. Usually it’s just opening packages and arranging all the little containers until everything fits. (That in itself is surprisingly satisfying. Kind of like building my own adjustable bento box.) 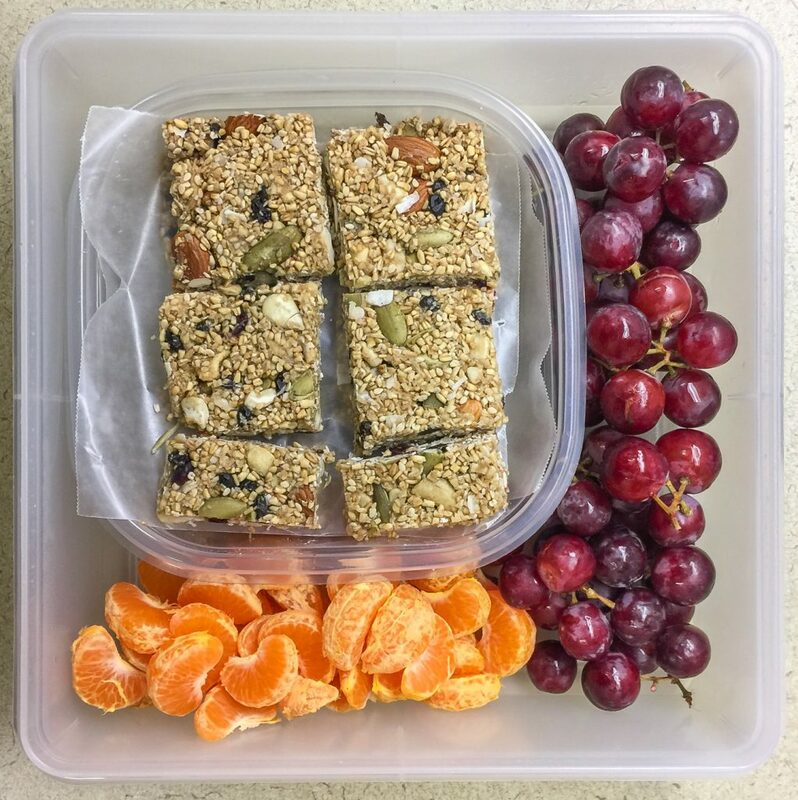 In the case of the granola bars, I did take time to make that recipe ahead but they last well in the refrigerator for a couple of weeks. So my Wizard buddies benefit from them, but so do I. They make for a sweet and chewy addition to my packed lunches. I’ve got whole grains, seeds, beans, fruit, and vegetables covered here which is ostensibly better than candy, chips, cupcakes, jerky, and microwave popcorn. 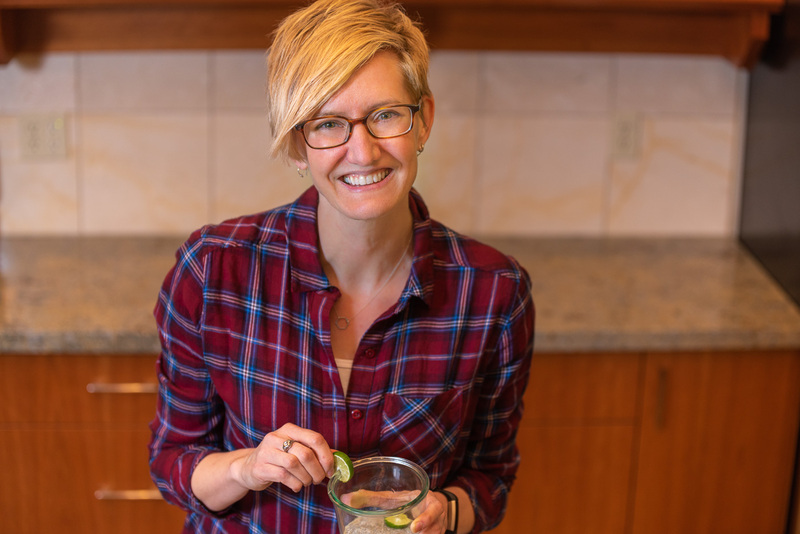 I want to eat healthfully, so I want to put smarter choices in front of my own face. The same holds true for my friends and coworkers. I don’t usually know about their individual health histories, but I sure don’t want to unknowingly put a tray of brownies in front of someone working on weight loss or a key lime pie in front of someone with high cholesterol. Most of us already have days filled with numerous temptations that we’re trying to navigate. If I can help it, I don’t want to be the source of yet another temptation someone has to struggle to say no to, or worse yet, something they’ll later regret eating. I would rather be the provider of a meal or snack they can feel good about and enjoy, guilt-free. OK, I’m starting to sound a little preachy, don’t you think? I guess it’s time to wrap up this post. I just know I feel better when I support the healthy habits of those around me whenever possible. By far I think the best way to do this is to find or make good food, put it in front of them, and see what happens. What do you bring to work or potlucks for your friends to nibble? Any suggestions for how I should fill my square Tupperware for next week’s Wizard gathering? 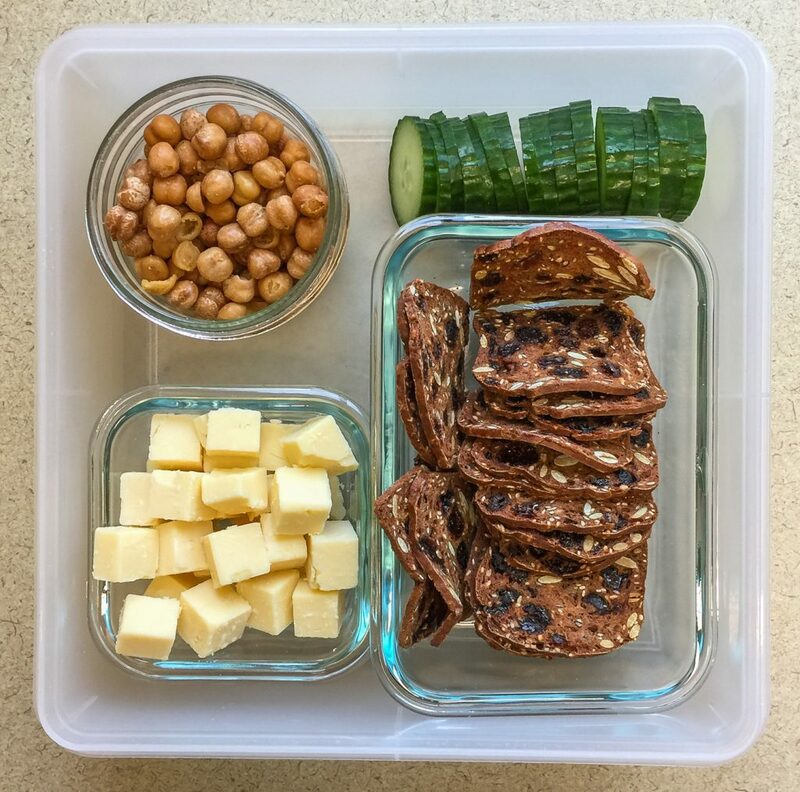 Your snack ideas are particularly timely for me, and I can always use inspiration!